Why can't you trust zoo animals to take tests? Because there are too many cheetahs Discover what to do with a blue triceratops and what happens when a hippo sits on a fence when you join this laugh riot. 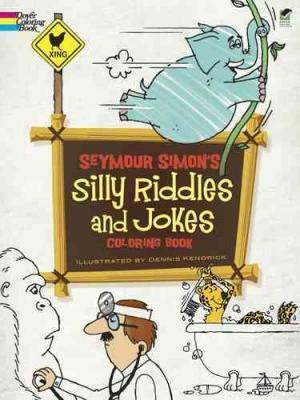 The popular children's author Seymour Simon asks and answers wacky riddles with an abundance of winsome puns. All jokes are illustrated by fancifully rendered dinosaurs and other animals in full-page, fun-to-color pictures. Praised by The New York Times as "the dean of children's science writers," Seymour Simon is the author of more than 250 highly acclaimed books, many of which have been named Outstanding Science Trade Books for Children by the National Science Teachers Association. Dennis Kendrick has illustrated more than 30 children's books as well as countless magazine articles, television projects, and advertisements. His work has been exhibited in museums as well as venues ranging from the Baseball Hall of Fame to the Pentagon. 5 Questions with Seymour Simon: An Exclusive Dover Interview Mr. Simon was gracious enough to talk with us about his career as a teacher, his affiliation with the Smithsonian Institution, how humor can get children interested in science, and more. You're a New York City native and a graduate of the Bronx High School of Science, so it sounds like you grew up in a highly urban setting. How and where did your formative experiences with nature take place? I have loved nature since I was a young child. Although I grew up in the Bronx -- a very crowded part of New York City -- the natural world was all around me. There is weather in the city, just as there is in the country. You can see the sun, moon, and stars from a rooftop in the city. And I explored a vacant lot on my street, which wasn't exactly a park, but still had birds, earthworms, small plants, and trees. In fact, when I grew up, one of the first books I wrote was called Science in a Vacant Lot. You were a science teacher for more than 20 years, and you've remarked that teaching is the best possible way to learn how to write for kids. Can you offer some examples of what your students have taught you? I'm still a teacher and still a student too, for that matter. Students' interests range wide and deeply. They want to be treated with respect and have their questions answered and have you pay attention to their comments. I'm constantly writing in the same way that I think. There is a famous story that explains my writing too. The story goes that there is a teacher who is teaching a difficult subject and he can see by the expressions on his students' faces that they don't understand what he is teaching. So he teaches it a second time and he can see that they still don't understand what he is teaching. So he teaches it a third time and finally...HE understands what he is teaching. That's how it goes with me. When I finally get it right, finally I understand what I'm writing and teaching. Some of your books are authorized by the Smithsonian Institution, which is a highly prestigious endorsement for any science writer. How did your affiliation with them develop? My publisher, HarperCollins made the arrangement with the Smithsonian Institution. What it meant for me is that I had an expert from the Smithsonian editing each of my books, which I am quite sure just made them better! It is indeed an honor to have my name associated with the Smithsonian. Does your recreational interest in nature photography contribute to your work?I am asked this a lot because there are so many photographs in my books. Sometimes I travel to places myself and take the photographs. I have photographed glaciers in Alaska, volcanoes in Hawaii, wildfires in California and weather in my backyard. Other times, I arrange to use other people's photographs. Often they are specialists -- like a scientist who has been living in Antarctica and observing penguin behavior. Someone like that has photographs that I could never get in a single, short trip. I love nature photography, and have done many, many of my books as photo essays because I know that children love these photographs, too. Some of your books -- Body Sense, Body Nonsense, for example -- take a playful look at scientific facts, so you must regard humor as a valuable tool in engaging young imaginations. What other approaches can parents and teachers take to get children interested in science and excited by the processes of observation and experimentation? I created a document for teachers called "Writing Exciting Nonfiction." This details many different ways that a nonfiction author can engage young readers. Anyone can download this resource from www.seymoursimon.com. Bonus Question! Do you have a favorite Dover book? I'm not sure if it is bad form to choose my own book, but I must say that I love Strange Mysteries. I wrote it many years ago, but today's kids are still fascinated by these mysterious, unsolved events.